With a population of just 180,000 Tunja is small compared to other capitals in the Andean region. It lies at an altitude of 2800m making it the higest department capital in Colombia, and consequently also the coldest. Wind and rain are frequent here and nights can be decidedly chilly. The city was founded in 1539 about an hour from the site where the Battle of Boyaca would take place some 280 years later and where Colombia effectively won independence from the Spanish colonizers. The city lies more or less at the centre of the more populated part of Boyaca and so serves as an excellent jumping off point for trips to most of the towns of interest in the area, including the magical Villa de Leyva. 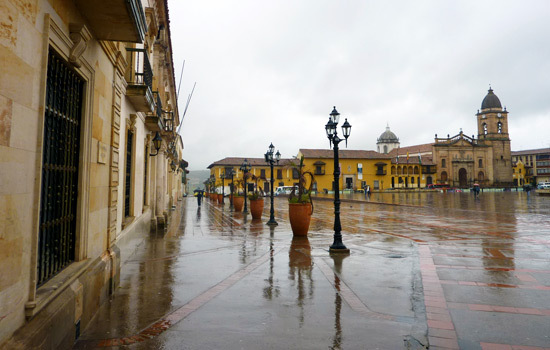 The Plaza Bolivar is the city's central square and is a bit reminiscent of the Bogota´s main square of the same name. Catedral Santiago de Tunja dominates the plaza with other colonial buildings occupying the other 3 sides. At the centre of the plaza is a statue of Simon Bolivar on horseback. The blocks surrounding Plaza Bolivar form the historic centre of the city and are pleasant to stroll around. Just east of Plaza Bolivar on Calle 20 (also known as Calle del Escribano) is the Casa de Don Juan de Vargas, an attractive colonial house which includes several displays of colonial artworks. Located witin a couple of blocks of Plaza Bolivar are Iglesia de Santo Domingo and Iglesia y Convento de Santa Clara La Real both well worth a visit. The best place to stay here is Hotel Hunza y Centro de Convenciones. The hotel has a good central location and includes an indoor swimming pool, gym and sauna. The hotel also offers free private parking. There are numerous restaurants scattered around the area of the Plaza Bolivar. Among the best is Restaurante Barbacoa located on the small plazoleta at the corner of Calle 20 and Carrera 8. Tunja has two football teams Boyaca Chico and Patriotas. The larger of the two clubs Boyaca Chico actually started their life in Bogota as Deportivo Bogota Chico FC. The club was named after the neighbourhood 'Chico' in the north of the capital where club founder and former professional footballer Eduardo Pimentel was born. They entered Colombian football at the lowest tier, Division C in 2002. After finishing their first season as champions they were promoted to Division B where they again claimed promotion at the first time of asking, this time to the top flight of Colombian football. The team played one more season in the capital before moving to Tunja in 2004. Boyaca Chico were crowned champions in 2008 after defeating America de Cali on penalties 4-2 after both legs of the final had ended in 1-1 draws. As champions Boyaca Chico, qualified for the Copa Libertadores in 2009. Despite winning three of their group games Boyaca Chico narrowly missed out on qualifying for the knockout stages after finishing third. Boyaca Chico are known as the "Ajedrezado Team" due to their chess board style strip. 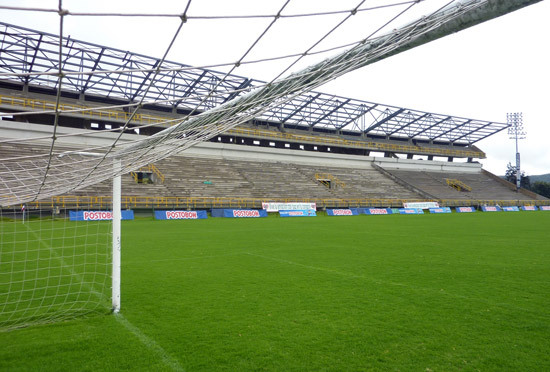 Chico play their home matches at the Estadio de La Independencia in the north of the city which has a capacity of around 21,000.